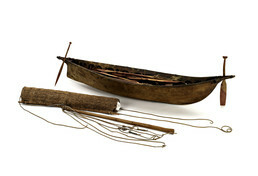 Paddles were used to propel a Yup’ik angyaq, or large skin boat, along with oars that were adopted after European contact; on this model both are shown. The boats had sails, in ancient times made of grass matting or skins and after contact sewn from trade cloth. Men built an angyaq‘s driftwood frame and lashed it together with seal thong; women sewed the seal or walrus hide cover and stretched it on the frame so that when dry it became drum-tight. People traveled, fished, and hunted in the boats, which once plied the Bering Sea and rivers of the Yukon-Kuskokwim Delta. Nena Rivers: Uumiakaneng piyuitaput angyameng taugaam. John Phillip, Sr.: Qagkumiutaullilria-wa . . . . Waten atulartut. Aron Crowell: How were these boats used? John Phillip, Sr.: Wiinga-w’ ellangellemni augna amllerqunek atunritaaqa. Malrurqugnek upagaqamta atulallruaput . . . . Tua-I-llu uksuyaamta cali aturluku upagluta. Nangnermek tua-I aturluku nanvan ceniini atunqigtevkenaku nangluni tua skin-aa taqluku. (After I became aware of life we didn’t use it many times. John Phillip, Sr.: Tua-I-wa makut taugaam atanrulalriit . . . Nangaqaata tua-I aturcigaliaqluki. John Phillip, Sr.: Tua-I makucilinqigtevkenani angyat amlleringarcata kassartaat. Nena Rivers: Sailboat made by muragauluteng-qaa? John Phillip, Sr.: Waten mimernanek bend-arluteng. Joan Hamilton: Maa-I, man’a-qaa maklauguq? Angyapik-qaa maklagmek pingqertuq? John Phillip, Sr.: Angyapiit-gguq amilallruit maklagnek, kaugpagnek-llu mamkellicarluki kaugpagnek angyat, palayat makut skinboat-at pililallruit. John Phillip, Sr.: Anguarutnguuq tamana. Virginia Minock: I know when we oar into the slough to get water, somebody used to have to hold a paddle in the back, and I used to like to do that. Nena Rivers: Yaa-I, alularsuutii. Alularluten. Joan Hamilton: There’s two kinds of oars, the slimmer ones for fast and then the wider ones for slower. Nena Rivers: Waten-ll’ taktataavakalrianeng wii tangyuitellruunga kanaggur. Joan Hamilton: These are really wide. Nena Rivers: Makut qagkumiutaat waten shape-angqerluteng. John Phillip, Sr.: Cukassaagarpeknani maa-I mana ayagcuun . . . Pitakaq canimellikan atur…Canimellikuni aturciqngataa wani-wa mana. Cukassaagarpeknani. Taugken cukangnaqsukuni wani cukaluni ayagyukuni wani ulegpaunranek aturluni. Pininruluni. Nena Rivers: Makut maa-I tengalraugut. Joan Hamilton: Augkut sail-at caugat? Joan Hamilton: Iqitailnguum qanrutellruanga akaurtellrani tamakut Qissunarmiut aturlalqait . . . up north-armuinun ayagyugaqameng . . . Qipcugaqameng-ll’ tuaten piluteng. Joan Hamilton: Natmun-gguq pitua? Nantevkarluku? Jon Phillip, Sr.: Tamani [There] somewhere in the middle. Ciuqvaarni yaavet elliluku pilaqait. Joan Hamilton: More towards the front. John Phillip, Sr.: [There is] supposed to be [a pin] on the bottom there . . . to mount it. Virginia Minock: Maybe that was nailed down right there. John Phillip, Sr.: Enililuki pilarait.